Many chronic conditions can lead to renal failure. Hypertension and diabetes can independently cause renal failure. The effect is compounded in patients who have both. Congestive heart failure can also be present and problematic. Medications have been developed that affect the normal physiologic pathways that maintain blood flow to the kidneys in order to both maintain flow and reduce systemic hypertension. Angiotensin converting enzyme (ACE) inhibitors are one common type. In order for the kidneys to function, blood is pumped through the aorta which supplies the paired renal arteries. Each artery branches multiple times until it reaches the functional unit of the kidney, the glomerulus. Blood flows into the glomerulus via the afferent arteriole and out via the efferent (e for exiting) arteriole. These arterioles are controlled by a hormonal regulation system that helps control how much blood flow and pressure each glomerulus sees. 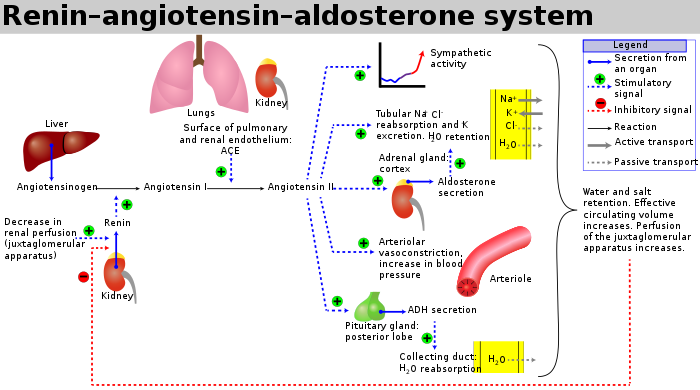 The hormonal pathway is called the renin-angiotensin-aldosterone (RAS) system. When renal blood flow (RBF) is reduced, cells near the glomerulus called the juxtaglomerular apparatus convert circulating prorenin into renin. Renin catalyzes the conversion of liver-produced angiotensinogen into angiotensin I. This in turn is a precursor for angiotensin II. The conversion is facilitated by angiotensin converting enzyme (ACE) found on the surface vascular endothelial cells, primarily in the lungs. Angiotensin II has several functions. First, it causes vasoconstriction, primarily at the efferent arteriole. It also stimulates secretion of aldosterone from the adrenal gland, which helps sodium reabsorption and potassium excretion. It also facilitates antidiuretic hormone secretion from the pituitary gland. Generally, angiotensin II wants to preserve circulating volume and blood flow. In normal physiology, renal blood flow (RBF) and glomerular filtration rate are maintained in a narrow range, regardless of blood pressure. Too much RAS activation though can lead to hypertension. Many medications affect particular steps in this pathway to disrupt that activation. ACE Inhibitors (ACE-i) function by blocking the angiotensin converting enzyme, decreasing the formation of angiotensin II (A-II). This can maintain renal function by decreased vasoconstriction and decreased sodium retention, while increasing renal blood flow. Glomerular filtration rate (GFR) may stay the same or even decrease, due to the differential effects on the afferent and efferent arterioles. Since A-II increases GFR by constricting the efferent arteriole relatively more, blocking A-II will dilate the efferent arteriole to a greater degree. The result is more blood flowing through the kidney overall, but less of it actually being filtered by the glomerulus. This effect on the kidney is reflected in an expected slight rise in creatinine after initiating ACE inhibitor therapy. The expected rise is usually between 10 and 20%. Acute kidney insufficiency (AKI) is defined as a rise greater than 0.5 if the serum creatinine was initially less than 2.0 mg/dL or more than 1.0 if the baseline was greater than 2. AKI is exacerbated in patients with congestive heart failure (CHF), and can occur even years after therapy was started. Four mechanisms have been proposed for how ACE-i cause AKI in this setting. The main mechanism occurs if ACE-i cause the mean arterial pressure to decrease to a point that renal perfusion cannot be maintained. The other causes include: simultaneous diuretic use, NSAID use, or high grade renal artery stenosis. Presuming the latter three causes have been excluded, ACE inhibitor-induced AKI can be managed with close monitoring of serum creatinine and potassium levels. Hyperkalemia is also common, as blocking A-II causes potassium to accumulate in the circulation. This is exacerbated in patients with diabetes, hyperglycemia, and on beta-blockers (which are common in CHF patients). Once adequately titrated, ACE-i therapy can continue as most induced AKI is reversible and potassium levels can be managed by reducing other potassium-retaining interventions. The long-term benefits of ACE-i should outweigh these short-term issues. Schoolwerth AC et al. "Renal Considerations in Angiotensin Converting Enzyme Inhibitor Therapy." Circulation. 2001; 104:1985-1991. This guest post by Jenna Smith discusses the necessary ingredients for becoming a surgeon. Individuals pursuing surgery as a career have to have what it takes to handle the job. With a lot of responsibility involved, including having another person’s life in your hands, surgeons have a tremendous amount of pressure to perform well at their jobs. Mastering the craft as much as possible can happen as long as people are willing to put in the work starting from when they’re in school and all the way through to the end of their career. Surgery cannot happen without the proper equipment. It isn’t possible to cut into flesh and fix broken bones without certain utensils and instruments necessary for those types of jobs. Everything from a scalpel to a surgical light needs to be well understood. Watch how others use these items whenever possible, either through video or observation. Another useful tip is to check out resources such as the Surgical Lights Buyers Guide to get acquainted with product details and better understand how to operate the equipment so it works the most efficiently. Though general surgery is an option, most people opt for a more specialized field. Plastic surgery, for example, is one of the most sought-after choices in the surgical world. After graduating from college, individuals then must go on to learn at a medical school. A doctor of medicine degree is received after completing four years. During the next three years, hopeful surgeons must complete their residency training. Doctors complete general training first before getting to choose a specialty and focus on only that area. A special certification will need to be obtained to practice surgery in one particular field, such as earning certification through the American Board of Plastic Surgery. If students think they can go to medical school and never have to study simply because they didn’t study much at their former college, they will be incredibly mistaken. Getting through medical school and preparing to become a surgeon takes a tremendous amount of work. Individuals need to study, study, and study some more if they are going to want to remember all of the information that gets packed into just four years of classes. Medical terminology, proper procedures, hospital rules and regulations, and laws all need to be learned and memorized before school is finished. Having a study system in place will be key to being successful. Studying for school isn’t the only thing to worry about. Once school is completed, students still need to become certified if they want to practice medicine. The ACLS and PALS tests are two options. If the job specialty you want requires these certifications, then it will take even more studying to prepare for either of them. Finding some good study methods that help retain as much information as possible is important for getting through these exams. Too many people believe that because they attended medical school and completed all of the required work and hours to become a surgeon, the learning is complete. They have now learned everything they need and can continue to do their job the same way forever. This is not true when it comes to surgery, not to mention medicine in general. Everything is always changing and adapting. New medicines are discovered. New machines are made for efficiency. Doctors must constantly continue learning and adapting to the world of medicine so they can offer the best care. Becoming a surgeon takes a considerable amount of effort, patience, and desire. People will quickly find out once they start practicing medicine whether they’re truly cut out for the field. With the gruesome tasks, life or death situations, and vast amount of responsibility, only those who can truly master the craft should perform surgery. Jenna Smith has been blogging since she graduated from the University of Utah. She finds herself spending less time writing due to a new venture called “MARRIAGE!” She enjoys her new venture very much. Lucky for us, she still finds time to write great articles, including this one. "When Breath Becomes Air" is a memoir written by neurosurgeon Paul Kalanithi. The book is a poignant look at the human spirit in both the pursuit of excellence as well as in coming to terms with its own impermanence. Kalanithi was a Stanford neurosurgery resident when he found himself becoming fatigued, with worsening pain and decreasing weight. A routine chest x-ray discovered multiple lung masses, which were soon proven to be metastatic lung cancer. The book was borne of Kalanithi's other passion, literature, as well as his unfortunately unique perspective as both a healer and now a patient at a time when he was poised to be at the peak of his talents. The first half of the book details Kalanithi's upbringing and path into medicine. His first love was literature, which he pursued all the way to a master's degree. However, upon further reflection, he felt a desire to pursue medicine after grappling with the question of the intersection of "biology, morality, literature, and philosophy." Since he had initially pursued literature, Kalanithi took two more years to complete the pre-med requirements and then apply to medical school. Accepted at Stanford, he was a fast rising star in the neurosurgery world, despite grueling 100 hour weeks year after year. The diagnosis, coming near the end of his training, shatters Paul's identity. After striving for close to a decade to become an attending neurosurgeon, his diagnosis is his undoing. He rapidly transitions from physician to patient, and has to learn to let go, to trust in others to have his best interests at heart. The book shows how he meditates that cancer in particular is pernicious in that it makes one mortality both immediate and yet still remote: no longer a hypothetical, but not an immediate reality. Everyone has an answer to what one would do with their last day, but what about one's last decade? Kalanithi then details the long road back to completing his training, the successes and failures of his treatment, and how he learned to live and ultimately succumb to his fate on his own terms. He died in 2015, leaving behind his wife Lucy and their newborn daughter. For me, the last part of the book was the most moving, an epilogue written by Lucy about Paul's last days. She charts the uncertainty of his final hours and how he was resilient even while facing the unknown. His final wish was that they see the book to fruition, in which they clearly succeeded. The book reads like what one would expect of a memoir of a first-time author, but Kalanithi's first rate intellect shines throughout. Even though he never uses the label, it is clear that Kalanithi was a humanist at heart. He does touch upon his wavering relationship with religion. For a reader who questions both their path in healthcare or wants a glimpse of how even the best laid paths can abound with uncertainty, "When Breath Becomes Air" will not disappoint.